We’ve had more questions recently about who and what Consumer Watchdog is. People have read these columns, heard us on the radio and seen us appear on the TV. They ask if we’re connected to Government? Are we related to an international organisation? Do we have legal powers and responsibilities? Consumer Watchdog is a legally registered division of a privately owned parent company. No, we’re not registered as a society, nor are we a charity or an NGO. We’re a private company, accountable only to our shareholders. In fact it’s a family thing, a bit like the Mafia, the leadership of North Korea and most evangelical churches, just without the expensive suits, executions and all the stealing. We’re also often asked about how Consumer Watchdog is funded. Where do we get the money needed to pay for our team’s time? In fact other than being paid for this newspaper column in Mmegi and one in another paper that features us, Consumer Watchdog has no sources of external income. All our costs are covered by our very generous parent company. We certainly don’t get anything from consumers. There have been occasions when grateful consumers have offered us gifts but our response has always been the same. If you feel the need to make a donation then give it to the Cheshire Foundation instead. We’re certainly not funded by any other agencies, not by Government, not by other consumer groups and not by any international consumer bodies. And guess what? We don’t want to be. We’re perfectly happy with the way we are. I like the fact that Consumer Watchdog is financially independent. Not taking money from anyone means we don’t have to take instructions from anyone. No one gets to tell us what to do. We’re not even allied to any other groups and, to be honest, we like it that too. While there are other consumer organisations out there both in Botswana and elsewhere, and while they do some good work, we don’t generally collaborate with them. I wish them the very best of luck but we prefer to do things our way. Independently. That doesn’t mean we won’t appear on the same platforms as them occasionally, we might talk to them, we might even agree with them. But their business is theirs and ours is ours. There’s even a consumer body in Botswana that described itself at a recent conference as “the mother body for all consumer groups within the country”. Sorry but no, they’re not our Mum, Dad or any other relative. As I mentioned before, we don’t like being told what to do. People have asked that as our parent company works with a variety of companies helping them to improve the quality of their customer service then does this put us in an awkward position when we receive a complaint against one of our client companies? No, it doesn’t. Without exception, every company we have ever worked with understands that there might be complaints about them and that we’ll do our best to resolve them. In fact almost all of the companies we’ve worked with have also been the subject of complaints. Luckily they’re mature enough to accept that this sort of thing will happen and know that these are valid complaints that are worthy of investigation and resolution. If we can help them to do that they’ll end up a slightly better bank when the problem has been fixed. They understand. Unfortunately there are also a few companies who aren’t as mature and sensible. There are certain car dealerships and importers, supermarket chains, holiday clubs, quacks selling “alternative health” products, multi-level marketing schemes and suspicious “investment” and stock market training institutions that we wouldn’t work with, whatever they offered us. We have standards. And morals. Regardless of how careful and diplomatic we are things don’t always go according to plan. We’ve had more than our fair share of legal threats but only from fools who’ve forgotten that we live in a country where freedom of expression is enshrined in our Constitution (Section 12, in case any lawyers have forgotten). They’re the same fools who have forgotten that Section 195 of the Penal Code says that a comment isn’t defamation if “the matter is true and it was for the public benefit that it should be published”. I can’t think of a better case of publishing something for the public benefit than news of consumers being abused. In fact every legal threat we’ve ever received has suddenly evaporated when we’ve told the lawyers to advise their angry clients that all we’ve done is report the truth. And reminded them what the law says about defamation and then published their threats on the Internet. I should also say that we’ve also been lucky with the support we get from Mmegi and our other print media partners. Every time there’s been a silly threat from a company they’ve backed us completely because they understand what we’re trying to do. So feel free to get in touch if you have a consumer problem and you need help. It won’t cost you a thing and we’ll be delighted to help if we can. Hello. I would like to check how authentic this on-line university is? Atlantic International University. Someone I know was offered a partial Phd scholarship, they were asked to only pay 22% of the fees but only if they do it in January. I felt like a scam. So it’s not actually accredited. Even the agency that they claim has accredited them is itself not a real accreditation agency. It’s clear that AIU is a fake university accredited by a fake organization, it’s as simple as that. Degrees from AIU are worthless and won't be recognized in Botswana. Your friend must realize that if he ever got a job or a promotion using a fake degree like one from AIU then he’d be a criminal. He’d have committed a fraud against his employer, just like anyone who obtains a financial advantage by lying. One final curiosity. They claim to be based in Hawaii, so why do they call themselves "Atlantic International University"? Hawaii is in the Pacific Ocean, not the Atlantic. Please be a good friend and make sure your friend doesn’t waste his time, money and reputation. My laptop just turned blank when I switched it on and I went to the store where I bought it for assistance because the laptop is still under guarantee. They said that my screen is damaged from the inside and their guarantee does not cover the Screen. They said I need to pay P1,600 for the laptop to be repaired because the guarantee does not cover that. My laptop is still with them, I didn’t take it because I could not understand why they said that. There was no crack on the laptop when I gave it to them and all thy said was that its damaged from the inside. I think this depends very much on what laptop model you have and what the warranty says. The manufacturer of the laptop might have some restrictions on what is covered but it’s impossible to know until we’ve seen the warranty. There are also potential problems with certain laptops models that are not supported in certain regions. For instance many laptops that you buy elsewhere in the world aren’t supported in Africa. Meanwhile the store isn’t permitted to make empty claims. Section 15 (1) (b) of the Consumer Protection Regulations requires a store to justify any claims that they make. Specifically they can’t quote “scientific or technical data in support of a claim unless the data can be readily substantiated”. In other words you deserve a full technical report on exactly what’s wrong with your laptop. Your first step should be to check the fine print in the warranty documents that came with your laptop. Then, if the screen is covered, write a letter to the store politely demanding a full technical report explaining exactly what’s wrong and what can be done to fix it. Meanwhile we’ll get in touch with the store for you. The New York Post reports that "Canada’s top consumer regulator has launched a formal inquiry into pyramid scheme complaints made against Herbalife". Thanks to A MLM Skeptic for the alert. A picture paints a thousand words, so they say. 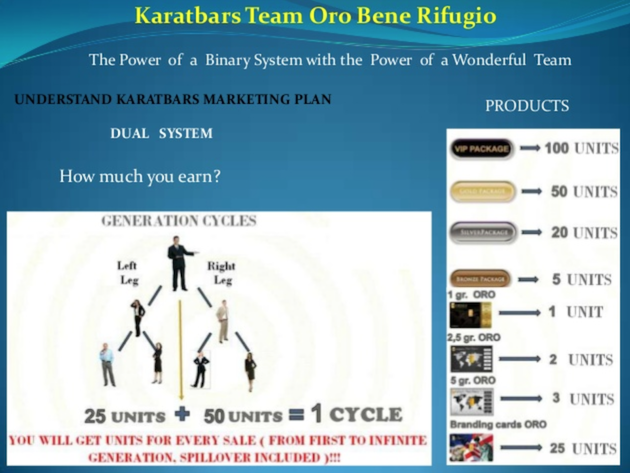 What word forms in your mind when you see these pictures from Karatbars sales presentations? 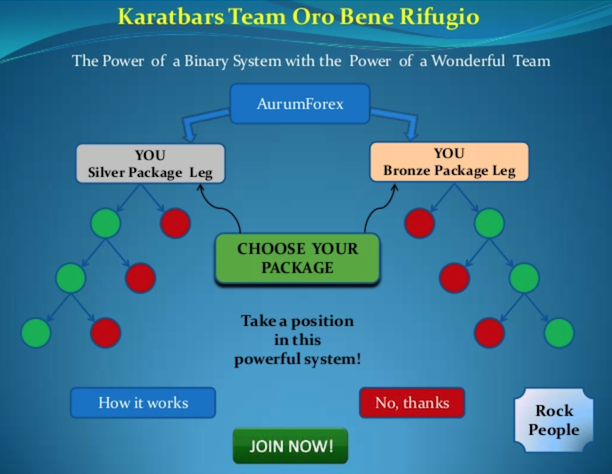 And what word forms in your mind when you see this picture which, according to Karatbars, shows the price of gold rising remarkably? 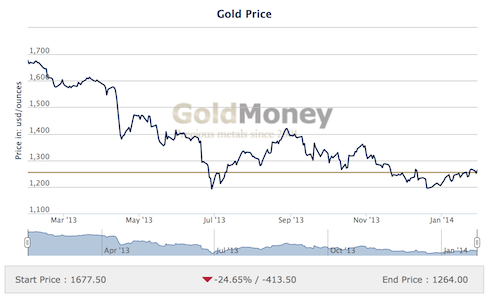 Whereas this is what actually has happened to the gold price over the last 12 months. Despite what certain people are saying, we do not endorse or give "a thumbs up" to this scheme. Anyone who says we do is lying. In fact I think this scheme is something else entirely. Does this image from their web site give you a clue? See here for a good summary of the fake university industry. "Currently some of the most advertised "online universities" are Eton University, Notting Hill College, Steadford University, Midtown University and Mayfield University. These are completely bogus higher education institutions. They have no relevant accreditation. Instead, they claim accreditation by various non-official bodies. But they are not the only ones. This is a game where names change fast. The only thing that remains is a trail of completely worthless degrees." It's worth a few minutes of your time. Yet another fake - Steadford "university"
Yet another peddler of fake degrees, this time calling itself Steadford "University". I can get a Masters degree in Clinical Psychology for just $1,199, having talked them down from $2,199. Pharoahe : How can i help you? [Me] : Hi. I need to get a Masters degree in clinical Psychology to get a promotion as soon as possible. Pharoahe : What's your last level of education? Pharoahe : and how soon are you looking into getting your Masters Degree? [Me] : I have a Bachelors degree in Psychology. Pharoahe : now how many ears of experience do you have in psychology? [Me] : I graduated 28 years ago, I've been working in HR since then. [Me] : How long does it take to study for the Masters degree? [Me] : What exams will I need to do? [Me] : How much will this cost? [Me]: That sounds very good to me but it's quite expensive. Do you need any further evidence than that? Ok, maybe there's one last thing. I asked for a Masters degree in CLINICAL PSYCHOLOGY, a field dealing with psychologically troubled people. Isn't is a risk to have such fake degree? Don't they care? [Me] : The job I want deals with troubled people in a clinical environment. Do you think this degree is OK for me to do that job? Steadford "university" is a fake. A nasty, disgraceful, immoral fake. Probably the biggest reason we don’t always get decent customer service is that we can’t be bothered to demand better. Think of all the times you’ve had a bad experience in a store, when someone’s either ignored you, charged you the wrong price or just been rude to you, all of those occasions when you vowed you’d complain, raise hell and not let the issue lie. All those occasions when in fact you did nothing and just put it behind you. We’ve all done it, I know I have. I’ve come home fuming, promising revenge or at least accountability and once the adrenaline has worn off I just wondered to myself, what’s the point? Why should I bother writing that letter, sending that fax or composing that email when it’s almost certain that it will have no effect? It will probably be ignored, perhaps even thrown straight in the bin so why waste my time? The truth is actually very different. With a few exceptions, most companies DO take complaints seriously. Some do it because the people in charge really care, they really want to fix problems because they’re decent and honorable people. Obviously they’re a rarity. More common are the companies where the people in charge realize that, even though it’s a real pain, fixing problems is just good business. They realize that most of their income is from repeat customers, people who bought from them before and chose to buy from them again. They’re the last people they should insult or treat poorly. A third group do it because they are doing their very best to make their brand synonymous with good service. It’s a core part of how they want to present themselves. Think of companies like Apple and Virgin Atlantic who make good service a central part of their brand identity. So far there are three groups of companies, the benevolent, the pragmatic and the brand-conscious, who will all respond positively to a complaint and will do their best to sort it out. They’re the easy ones. A simple, polite complaint is probably all you’ll need. Either that or an email to us and things tend to get resolved more often than not. Then there’s another group, a slightly trickier group to handle. These are the wimps. They’re often not the best at responding to initial complaints, probably because they don’t know how to manage them. They’ve never thought of complaints managements before and simply don’t know what to do. The commonest reaction you get from complaints wimps is silence. However they very often respond well to a second approach that threatens them with hellfire and damnation, otherwise known as “the press”. A hint that they’re going to be in the papers or on the radio very quickly encourages them to spring into action and fix things. Then you get into the trickier types of supplier. We’ll start with the deniers. No, they’ll say, it can’t possibly be our fault that something went wrong. In fact the customer is wrong, an idiot, perhaps even lying. These suppliers need to be taught a simple lesson. No, not as some people night suggest, that “the customer is king” because clearly the customer is NOT royalty, he or she is just an ordinary guy who bought something that doesn’t work. He or she is actually just a customer with rights, rights that can be enforced. This group of suppliers needs to understand that customers have a right to get what they paid for and to products that do what they said they would do. They also have a right to buy products that will last a reasonable length of time if they are treated correctly. There is, for instance, a certain chain of footwear suppliers whose standard response to any product fault is to accuse the customer of mistreating their shoes even though there is precisely no evidence. It’s their normal response to deny that there could possibly be anything wrong with their products and the customer should just put up with shoddy goods. Then there’s the most difficult type to deal with. They are the Seriously Horrible Intimidating Traders. I’m sure there’s an acronym that can be developed for them. They’re just nasty, horrible people. They don’t listen to reason, they don’t respond to courtesy and they will only resolve your problem when you, or someone you ask for help, is prepared to get nasty with them. They’re bullies and the only way to respond to a bully is to look them in the eye and punch them in the face. Metaphorically I mean. Unfortunately, it shames me to say that a significant section of this group are pale-skinned people from across the border who still have a distinctly pre-1994 mindset. The sort of people who, in conversations with me, thinking that because I’m also pale-skinned I might share their outlook, have quietly said things like “Well, you know, these people…”. The only way to deal with such companies is to get rough. You stand up to them, you complain forcefully and repeatedly to them, write to Mmegi, call Consumer Watchdog, call the Consumer Protection Unit, engage every possible regulator and never, ever give up. Stores we’ve dealt with like this have told us after the dust has settled that they lost business because of the fuss that was made. Others haven’t been able to give us feedback because cellphones aren’t allowed in police cells. So the lesson is simple. Apathy won’t change anything for the better. Only action will. Taking action is almost always easy, almost always successful. Apathy achieves nothing. A simple example. Go to our blog or Facebook group and follow the link to our banking survey. A little action from you will help us put pressure on banks to get a bit better. Surely it’s worth a try? My friend bought a 7 inch tablet from this company but after 2 days from the day of purchase the guy raised a complaint that the battery doesn’t last and some problems like the speaker. The boss of the company took the tablet for almost 1 week claiming that he is fixing it. Then he returned it saying that he will fix it because he was still busy. The guy returned it again and it was with the boss for almost 3 weeks but the studies for that guy was suffering so the tab was returned to him and the boss of the company said he replaced the battery and fixed all the problems. After 4 hours of use the guy complained saying the matters are worse, he contacted the boss again but the boss wouldn’t take his calls. He went to the boss home and found the wife who he told about the issue, and the wife gave the guy a new tablet. We were relieved that now he will study well but after 2 days he complained that the screen freezed. Now he is tired of all this and wants to sue the company he bought it from. We want to sue him as he refused a refund and he also delayed the studies of my friend. The time has come to teach this store owner a lesson about consumer rights. Section 13 (1) (a) of the Consumer Protection Regulations says that things you buy must be of “merchantable quality”. Merchantable quality means that something you buy must be "fit for the purposes for which commodities of that kind are usually purchased”. This means that something you buy must do what it says it does. A cellphone must be able to make calls, a fridge must make things cold and a tablet computer like yours must just work properly. I suggest that you write a letter to the store and deliver it either by hand or by fax. It should say that they have breached the Consumer Protection Regulations as I mentioned and give them 14 days to remedy the situation either by giving you a replacement tablet that works properly or a complete refund of the money you spent. Tell them that if they fail to do so you’ll take any necessary legal action to recover your money. Make sure you tell them you’ve contacted us and have sought our advice. Meanwhile we’ll get in touch with them to encourage them to do the decent thing. I bought a Blackberry Bold 9720 cell phone on 27th October 2013 from a store at Airport Junction mall in Gaborone. In two weeks I reported that the cell phone is getting too hot even when I'm not using it and if this happen the battery get drained immediately and the response was just go and observe it again otherwise that is how it is. On 20th November I discovered that it cannot charge the battery and I took it back to them. They tried to charge it and it didn't charge then they said they are going to take it to the technicians to check it. Their feed back that I got from them after taking their time was that I have damaged the cell phone and they won’t repair it. I don’t know what proofs that i physically damaged it. I believe that they have knowingly sold this damaged cell phone to me purposely. I have spent P2749.00 for that cell alone and that is the service I got from them that and should come and collect that faulty instrument. I don’t think there’s any evidence that they deliberately sold you a faulty phone but you have certainly been mistreated. I suggest you write them a letter explaining that they have breached Section 13 (1) (a) of the Consumer Protection Regulations by selling you something that isn’t of “merchantable quality”. You should also tell them that the breach Section 15 (1) (b) of the Regulations if they don’t quote “scientific or technical data in support of a claim unless the data can be readily substantiated”. You deserve a full technical report on exactly what’s wrong with your phone rather than just this feeble suggestion that you’ve damaged it. You have a right to a technical report proving what’s actually wrong with the device. We’ll also get in touch with them to see if they can’t be a bit more helpful. 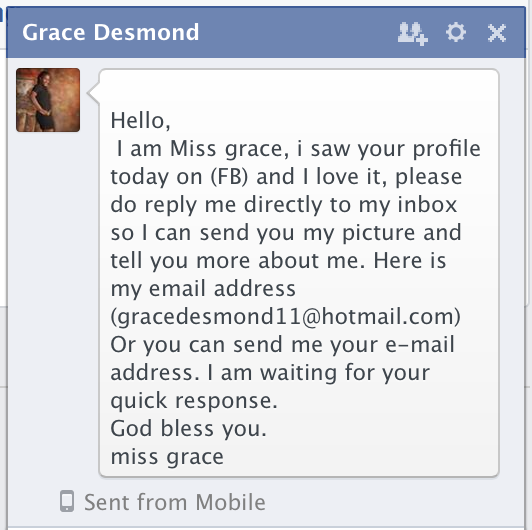 Yet another scammer appears, this time on Facebook. It's a fairly common occurrence on Facebook but luckily they're easy to spot if you have even a trace of skepticism. You know, I suspect this isn't really her picture. Why don't you send her an email, telling her what you think of her? Just don’t do it, OK? Roaming on your cellphone is a very good way of bringing back an unexpected souvenir from your trip abroad. A staggeringly huge phone bill. If you think P50,000 is a lot of money for some data roaming, then think again. We’ve heard of bills, much, much higher than this. Last year a reader approached us with a nightmare story of a truly enormous roaming bill. 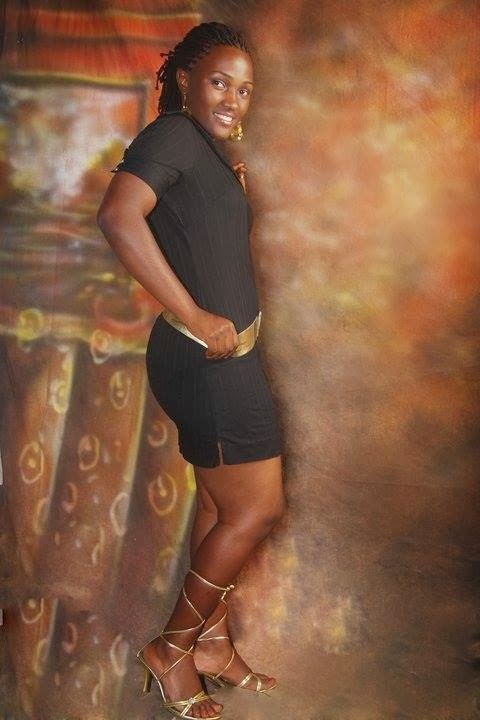 Her son had travelled to South Africa and taken a Mascom 3G-enabled iPad with him. After he’d been there for about a week the Mum got a call from Mascom warning her that her son had already built up P20,000 in roaming charges and suggesting she tell him to switch it off. Startled, she did exactly that and he stopped surfing immediately but that wasn’t the end of the story. Their bill for the iPad’s holiday to SA arrived at the end of the month and was for a jaw-dropping, staggering, heart attack-inducing P280,000, all for one week of web surfing. Obviously the first thing they did was demand a detailed bill from Mascom that justified this astonishing amount of money. No luck, that was impossible. All Mascom could say was that they’d received a massive bill from Vodacom and it was up to the customer to pay it. To be fair both Mascom and Orange will tell you, if you ask them, that you should consider switching your data roaming off if you travel abroad but I don’t think they do nearly enough. They can’t give you any indication of quite how expensive it can be. So I did. I called the Orange call centre and asked them what the rates were per megabyte if I went to South Africa and roamed with either MTN or Vodacom. The news was bleak. After over 10 minutes on hold they confirmed that the rate with Vodacom was a massive P45. If I connected to MTN they had no idea what it would cost me. They simply didn’t know. Mascom show the data roaming rates for MTN (between P6 and P7 per megabyte) on their web site but give no clues about the price of data roaming with Vodacom. When I called Mascom and asked them the same question they also confirmed what I’d found online. The data rate with MTN was up to P7, which the call centre operator was honest enough to describe as “very high”. When I asked about data using Vodacom the answer was actually very honest. “We’ve had instances where people can connect but the charges are actually ridiculous” I was told. It’s simply not good enough. I don’t think it’s too much to ask for them to at least give us a clue what it will cost us if we try and pick up our email or surf the web when we’re away from home. Meanwhile there’s a much simpler solution. Just don’t roam. Instead get a local SIM card in the country you go to and use that instead. If you absolutely need to use your Botswana number abroad only use it for receiving calls and make any out-going calls on your new foreign cellphone. A cheap cellphone will cost you P250 before you go (probably less in the country you visit ) and use that with your new foreign SIM card. I know in South Africa and some other countries you have to prove a local address when buying a SIM card but your hotel, guesthouse or host will lend you their address if you ask them nicely. I urge you to do this, it might save you a small fortune. Meanwhile I think it’s time for Consumer Watchdog to write to the cellphone companies and their regulator, BOCRA about this, don’t you? On First Issues again, this time talking about store security and what security guards can and can't do to you and the people around us with fake degrees. This time talking about store returns and then, bizarrely, about Ponzi schemes. Anyone who can think of a meaningful connection between the two subjects gets a free Consumer Watchdog pen. Why would you buy gold? 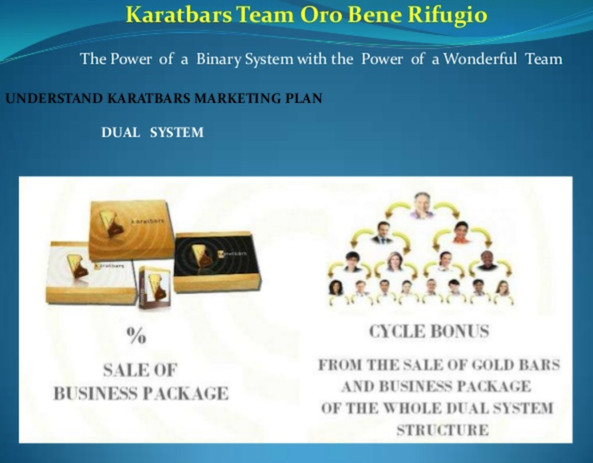 And why would you buy it from Karatbars? There many silly things you can do with your money but one of the silliest is invest in something when its price is steadily dropping. You don't have to be a financial expert to know that. If I invest today in something that's worth P100 per share and tomorrow the price falls to P90 I've lost 10% of my money. If by the end of the month it's only worth P50 than half of my investment has evaporated. I now need to wait for the price to double just to get my original "investment" back and be where I started. Gold would be a very good example of this. Looks impressive, doesn't it? The price is climbing. But look closely at the x-axis. Those aren't dates, they're times. That's the price of gold over just a few hours. This is what the gold price has done over the last YEAR. A very different picture. An ounce of gold that you bought a year ago for $1,700 is now only worth $1,250, losing you $450, 26% of your original investment. 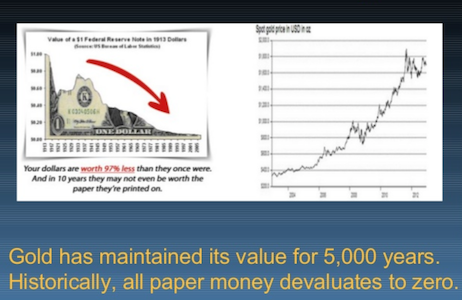 So why are companies trying to sell us gold? Perhaps it's because selling gold isn't really their business? Is it actually not about the gold, but the fees you have to pay to buy the gold? Then you have the lies their local representative tells. 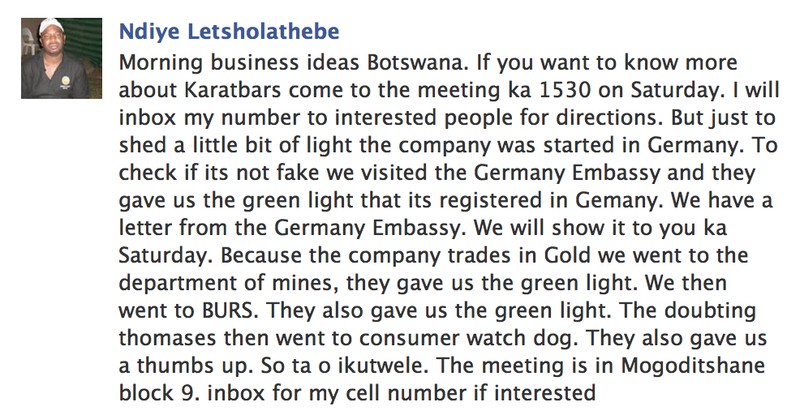 Following a tip-off I SMSed their local rep earlier today and asked about the Karatbars scheme. As with all such schemes he seemed reluctant to tell me everything but instead invited me to a meeting this coming weekend. Then came the surprise. Karatbars had been endorsed, he said, by some serious authorities. The reader who tipped me off about one of them and I think you'll work out who I mean. Let's make this clear. Consumer Watchdog has never, does not currently and will never endorse any pyramid, network marketing, multi-level marketing or Get Rich Quick scheme. Certainly not this one. This is your way to send a message to the banks on what you think they're doing right and, more importantly, what they're doing wrong. Click here to complete the survey. It'll only take 5-10 minutes of your time. You never know, they might even listen and do something to make it better! Can consumers trust scientists and the things they say? Should you believe the things that scientists tell you? The answer is, of course, yes, you can trust what scientists say and what their findings suggest but ONLY if they really ARE scientists and what they’re saying is actually science. The problem is that the vast majority of us aren’t qualified to evaluate everything we’re told by so-called experts. Another problem is that part of the business world is dedicated to confusing us about science and facts in general. It’s what scientists call “the advertising industry”. We’ve all seen advertisements for products, usually washing powders and anything claiming to offer health benefits, that are presented by a man (and it always seems to be a man) wearing a white suit, trying his best to add some scientific authenticity to whatever product it is he’s selling. Of course he’s not really a scientist at all, he’s an actor pretending to be one. This is a good example of a logical fallacy. Logical fallacies are mistakes in thinking that lead us to false conclusions. The one the advertisers are exploiting in these advertisements is called the “argument from authority”, which has been defined as “a fallacy of irrelevance when the authority being cited is not really an authority”. The scientist in the advertisement isn’t actually a scientist so why should we believe what he says? To be fair, it’s not just the advertising industry. There’s no shortage of industries that are prepared to hijack supposed authority figures and use them in an argument from authority. Albert Einstein is a very good example of this. Einstein was remarkably gifted as both a theoretical physicist and as a humanitarian but that’s where his skills ended. Any appeal using poor old Einstein’s name in any other area can easily be false. Einstein’s thoughts on religion, philosophy and horse racing are no more likely to be correct that yours or mine. In the same way, the thoughts of a religious leader on biology or geology, those of a medical doctor on spirituality and those of a combi driver on anything at all are not necessarily worthy of respect. 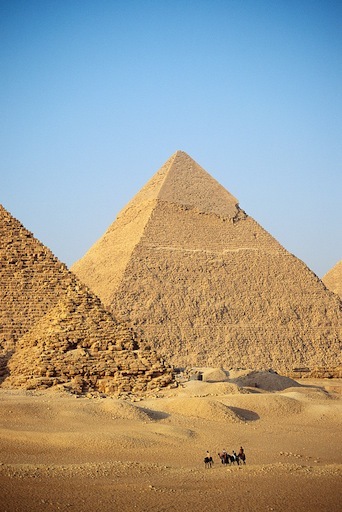 The appeal to authority is also endemic in the Multi-Level Marketing industry, the distant cousin of the pyramid scheme. 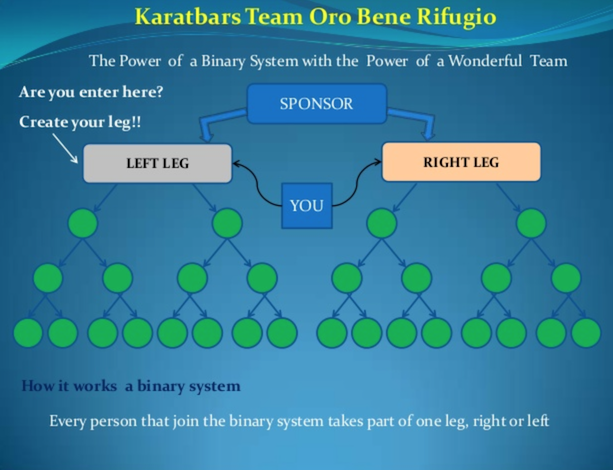 Almost all of them quote Robert Kiyosaki, the overrated author of Rich Dad Poor Dad, and the billionaire speculator and philanthropist Warren Buffett, both of whom, the MLMs say, have endorsed the MLM industry. However here’s a fact that the MLM advocates don’t tell you. Neither of these two “authorities” have ever made money by being involved in selling products in a Multi-Level Marketing scheme. Kiyosaki actually made his money by selling his book to Amway recruits as part of a deal with Amway management. What they also won’t tell you you is that Kiyosaki’s book appears to be at least partially a work of fiction. There was no Rich Dad. Warren Buffett also made his money without actually doing any MLM work. All he did was buy an entire MLM company that already existed. 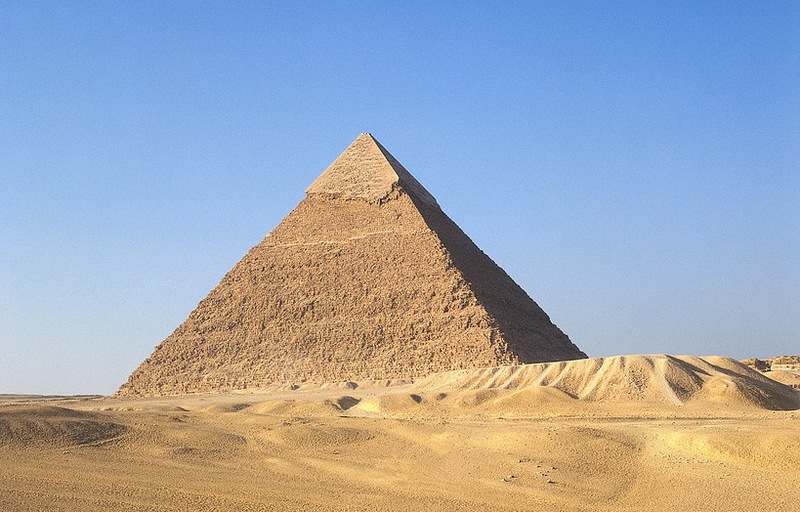 When you’re that rich you can buy your way to the top of the pyramid in one step. That’s really the only way to make money from such schemes: buy the entire scheme. The real concern for me is the use of the argument from authority in things that really matter: health, education and food. Last year an article was published in the journal Food and Chemical Toxicology reporting the results of a study that spread alarm throughout the world. The press coverage of the article claimed quite clearly that genetically modified foods caused cancer. Newspaper headlines suggested that “rats fed genetically modified corn grew massive tumors”, referred to “shocking cancer findings” and others said that GM foods cause “tumors, organ failure and premature death”. Some articles even showed pictures of rats with enormous growths all over their bodies. Unfortunately the story was much more complex than this. To begin with there were numerous problems with the experiment. It turns out that the type of rat they used develops these tumors all the time, particularly if they are overfed or if they’re older than average. It also seems that the researchers only published some of the results, ignoring groups of rats that were fed GM foods but which didn’t subsequently develop the tumors. The researchers were also somewhat selective when it came to “peer review”, the normal process where other researchers are permitted to review the research before it’s published. Not in this case. Professor Anthony Trewavas from the University of Edinburgh, a genuine authority on these issues, was quoted by New Scientist magazine as saying “these results are of no value”. A couple of weeks ago the story changed. The Food and Chemical Toxicology journal completely withdrew the article and the publishers, Elsevier, issued a statement saying (and I'm paraphrasing) that while the researchers hadn't actually lied, they had been guilty of very poor science. The background information that wasn’t originally made known is that the lead researcher in this study also heads the scientific board of the “Committee for Research and Independent Information on Genetic Engineering”, an organization opposed in principle to genetically modified food and he also has a book and film coming out entitled “All of Us Guinea-Pigs Now?” He’s hardly unbiased. My point isn’t to attack people who oppose GM foods, although there is precisely no genuine scientific evidence that I can find that suggests they are in any way harmful. The point is that even though science is the most powerful weapon we have in the fight against disease, poverty and ignorance, all of that is undermined when the scientists we rely on to educate and inform us turn out not to be real scientists. If we’re going to make rational decisions on matters as important as food then we need to rely on real authorities rather than pseudo-scientists peddling an agenda rather than facts. It’s critically important that we all develop a much better understanding of science if we’re going to make correct decisions.